I regularly use Alan Renouf’s excellent vCheck powershell utility to help me manage and maintain some sort or order with my ESXi hosts. Unfortunately the good people at VMware are charging ahead advancing the features of vSphere, which means that some useful powercli commands are deprecated from time to time. This can break some vCheck plugins and hence the authors are often pestered for updates to support the newer versions of ESXi. One of our users at virtualDCS was recently experiencing problems recovering data using the vSphere ‘VMware Data Recovery’ (vDR) release 1.2 within their CentOS Linux VM using the ‘File Level Recovery’ (FLR) tool. I won’t go into detail with regards to describing the tool, as it has been expertly described here, and documented here already. Although the vDR appliance was reporting successful backups, the FLR utility was not mounting all the partitions when accessing a selected restore point. The virtual machine in question was running CentOS 5.4 32bit, and had just a single vmdk but had a specific partition layout which caused issues with vDR. It was these two 8e LVM partitions that vDR had issue with. (98) "Mon Feb  7 00:09:09 2011"
(99) "Tue Feb  8 02:53:03 2011"
root mount point -> "/root/2011-02-07-00.09.09"
"Mon Feb  7 00:09:09 2011"
VixDiskLib: config options: libdir '/opt/vdr/VMwareRestoreClient/disklibpluginvcdr', tmpDir '/tmp/vmware-root'. VixDiskLib: Could not load default plugins from /opt/vdr/VMwareRestoreClient/disklibpluginvcdr/plugins32/libdiskLibPlugin.so: Cannot open library: /opt/vdr/VMwareRestoreClient/disklibpluginvcdr/plugins32/libdiskLibPlugin.so: cannot open shared object file: No such file or directory. DISKLIB-PLUGIN : Not loading plugin /opt/vdr/VMwareRestoreClient/disklibpluginvcdr/plugins32/libvdrplugin.so.1.0: Not a shared library. VixDiskLib: Failed to load libvixDiskLibVim.so : Error = libvixDiskLibVim.so: cannot open shared object file: No such file or directory. [msg.dictionary.load.openFailed] Cannot open file "/etc/vmware/config": No such file or directory. PREF Optional preferences file not found at /etc/vmware/config. Using default values. [msg.dictionary.load.openFailed] Cannot open file "/usr/lib/vmware/settings": No such file or directory. PREF Optional preferences file not found at /usr/lib/vmware/settings. Using default values. [msg.dictionary.load.openFailed] Cannot open file "/usr/lib/vmware/config": No such file or directory. PREF Optional preferences file not found at /usr/lib/vmware/config. Using default values. [msg.dictionary.load.openFailed] Cannot open file "/root/.vmware/config": No such file or directory. PREF Optional preferences file not found at /root/.vmware/config. Using default values. [msg.dictionary.load.openFailed] Cannot open file "/root/.vmware/preferences": No such file or directory. PREF Failed to load user preferences. DISKLIB-LINK  : Opened 'vdr://vdr://vdrip:1.1.1.40<>vcuser:<>vcpass:<>vcsrvr:<>vmuuid:<>destid:39<>sessdate:129415109490000000<>datastore:P4500-DS05<>vmdk_name:CusClone1-WEB-1.vmdk<>oppid:4499' (0x1e): plugin, 167772160 sectors / 80 GB. DISKLIB-LIB   : Opened "vdr://vdr://vdrip:1.1.1.40<>vcuser:<>vcpass:<>vcsrvr:<>vmuuid:<>destid:39<>sessdate:129415109490000000<>datastore:P4500-DS05<>vmdk_name:CusClone1-WEB-1.vmdk<>oppid:4499" (flags 0x1e, type plugin). DISKLIB-DSCPTR: "/tmp/flr-4499-w4U6cS" : creation successful. SNAPSHOT: IsDiskModifySafe: Scanning directory of file /tmp/flr-4499-w4U6cS for vmx files. VixMntapi_OpenDisks: Mounted disk /tmp/flr-4499-w4U6cS at /var/run/vmware/fuse/2848693010656666867/flat. MountsDone: LVM volume detected, start: 106928640, flat file: "/var/run/vmware/fuse/2848693010656666867/flat"
MountsDone: LVM volume detected, start: 10733990400, flat file: "/var/run/vmware/fuse/2848693010656666867/flat"
System: running "lvm version 2>&1"
LoopMountSetup: Setup loop device for "/dev/loop1" (offset: 106928640) : "/var/run/vmware/fuse/2848693010656666867/flat"
LoopMountSetup: Setup loop device for "/dev/loop2" (offset: 2144055808) : "/var/run/vmware/fuse/2848693010656666867/flat"
System: running "lvm vgdisplay 2>&1"
Couldn't find device with uuid '1KPTt2-2Kya-Wk4H-MDz7-0tgJ-a82T-N6OsIX'. LVMFindInfo: found "VG Name" -> "VolGroup00"
System: running "env LVM_SYSTEM_DIR=/tmp/flr-4499-2kqxja/ lvm pvscan /dev/loop1 /dev/loop2 2>&1"
System: running "env LVM_SYSTEM_DIR=/tmp/flr-4499-2kqxja/ lvm pvdisplay /dev/loop1 /dev/loop2 2>&1"
Failed to read physical volume "/dev/loop2"
LoopDestroy: Removed loop device "/dev/loop1" (offset: 106928640) : "/var/run/vmware/fuse/2848693010656666867/flat"
LoopDestroy: Removed loop device "/dev/loop2" (offset: 10733990400) : "/var/run/vmware/fuse/2848693010656666867/flat"
Once again, only the /boot non-LVM partition held on /dev/sda1 was mounted. You can see from the results above that the LVM mounts failed due to a fatal error. I wasn’t sure whether there was an undocumented incompatibility with my LVM version or fuse version, so I took the easy route and logged a call with VMware Support SR# 1589684961. After eliminating the obvious the ticket was escalated to a Research Engineer who was excellent (aren’t they all?). He told me that VMware was aware of an issue with multiple LVM partitions and were expecting to include a fix in an upcoming relase of vDR. That was great, but my customer needed to ensure his backup process allowed FLR restores. I had to find a workaround that could be implemented without requiring a reboot as the virtual machine in question was aiming for 100% uptime. My plan was to add a new vmdk to the VM, and migrate the data off the two existing LVM partitions, remove them both, than create a single LVM partition on the original disk and migrate the data back, before removing the temporary disk. I have no idea if the above will be of use to anyone, so please let me know if you find it helpful in any way. The new version of vDR will include a new version of the FLR tool anyway so let’s hope the issue is resolved in that. I was recently asked to look into a problem a client was having with his vSphere vDR backup routines. All guest machines were being successfully backed up apart from one. "Failed to create snapshot for proxy, error -3960 ( cannot quiesce virtual machine)"
"Cannot create a quiesced snapshot because the create snapshot operation exceeded the time limit for holding off I/O in the frozen virtual machine." Obviously I began scouring the forum posts at http://communities.vmware.com but found a whole range of posts regarding quiesced snapshots, all of which I found rather confusing. All the virtual machines on this system were built from the same template. All therefore had the same VMware tools installed, in the same way, and only one was having this issue. In the end, I decided to investigate the TMG services to see if they were causing the VSS to fail themselves. When all TMG services were stopped, the snapshots worked with no errors!!! I then began selectively stopping them to see which was causing the problem, and found my culprit – the ISASTGCTRL service. This service, described here by Marc Grote, is used to store the TMG configuration in the AD-LDS (Active Directory – Lightweight Directory Service). When the service is running, snapshots fail, and when stopped, they succeed. Hence, when the snapshot is called by VMware tools, it first checks this folder for any scripts to run. When the snapshot is taken, it passed an argument ‘freeze’ to the script, and when the snapshot is finished, it passed the argument ‘thaw’ to the script. In doing so, the script successfully stops and then re-starts my problematic service. 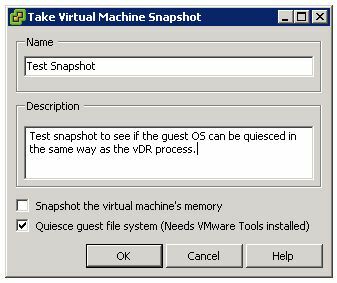 Now when the scheduled VMware vDR process runs, the appliance is able to take a quiesced snapshot successfully. Happy days.